Dautov Eldar Khamirovich graduated from the Ekibastuz Engineering and Technical Institute with a degree in "Open Development of Mineral Deposits", qualified as a mining engineer. He started his professional career in 2005 at the "Vostochny" coal mine as an assistant to the excavator driver at the mining site No. 1 (UDR No. 1). A month later he was transferred to the same position on the SRSk (2000) rotary excavator. In 2006 he became the mining master of the section No. 1 of the "Vostochny" coal mine. In 2008, he appointed as the head of the department for the prospective development of the "Vostochny" coal mine. 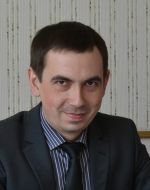 In 2010, he became the Chief engineer of the Investment Development Department of JSC "ECE". In 2012 has has been the Chief engineer of the department of capital construction of the "Vostochny" coal mine. In 2013 he became the head of the technical service of the "Vostochny" coal mine. Since 2016 until present he has been Chief Engineer of the "Vostochny" coal mine. Eldar's professional career is connected to the mining industry. Mr. Dautov proved himself to be a competent, highly qualified specialist, who perfectly knows well the profession. Intensification of coal extraction with a limited front of mining operations and steeply inclined coal seams. Use of gradual increase method in freight turnover by technological road transport.